Currently President and CEO of the J. Paul Getty Trust and previously Director and Professor of the Courtauld Institute, Dr James Cuno was warmly welcomed to a full lecture theatre of academics eagerly awaiting his discussion of the issues surrounding the encyclopedic museum. Current debates often attack encycopedic museums as imperial in their approach to the display of cultures; that they are symbols of state power and control and merely stagnant repositories of knowledge and culture. Dr Cuno’s counter to this argument began with the world-famous example of the British Museum founded in 1753. An encycopedic museum from its very beginnings, the BM offers a diverse collection that aims not at the specialisation or control of knowledge but rather its accessibility. The idea of an ‘Enlightenment vision’ with freedom as a human right is thus introduced and is something that must be considered throughout Dr Cuno’s discussion, after all, how free is a museum experience, and if it is not total freedom, is this a repression of a basic human right? On a very basic level in museums, objects tell stories when positioned next to other objects. The difficulty comes in finding the right balance between focusing on each individual artwork and their presentation both aesthetically and in relation to the surrounding objects. This brings us to Dr Cuno’s suggestion that museums should never have a spine so to speak, but instead act more like a sponge. The intenton being that visitors are not under the control of the institution, but rather explore museums as they wish, creating their own path. But how true is this in a controlled space? We are led think deeper into Dr Cuno’s suggesion of free-will more generally: with the encyclopedic museum acting as a sort of microcosm for life, are we ever free to make our own interpretations? This issue is problematic in light of contemporary debates which instead tend to raise the issue of the ‘scripted’ visit: the museum as a subject containing a pre-subscribed state ideology that unknowinlgy restricts our freedom of thinking and experience of objects. Dr Cuno however, remains somewhat idealistic. He believes that museums ‘disarm’ us to allow us to think in new and profound ways, to forget ourselves and create our own story through interacting with each object and collections of objects. We then move on to Dr Cuno’s case study: a blue and white ceramic jug. We are asked to consider how the display of the object changes visitors’ and our own interpretations of it. We are provided with a detailed history of the object from all angles, certainly making us consider the significance of the level of information available beside an object. The important thing, Dr Cuno asserts, is that any level of research begins with the object, before the discourse. Another interesting idea that was put forth is the idea of visitors as travellers through encyclopedic museums, perhaps as explorers of culture and knowledge, with the action of walking between objects and making connections opening our eyes to cultural relations and art. Dr Cuno does tackle the legacy of empire that such thinking implies, but asserts that there is evidence of empire in almost every object in encyclopedic museums and questions whether this should necessarily be the focus, let alone the aim being to search it out. The important thing is that museums respect individual agency so as to ensure no prejudice or priviledge in the way cultures are presented, and thereby to promote an understanding of difference. Earlier this term I discussed the debate that was organised by the MA Curating students, Museums without Walls: Showing Art in a Digital Age. As a topic that is so current, Dr Cuno passionately argued that digital doesn’t offer the confrontational and conversational approach to objects and public speaces, as well as the meditatory aspects, that a physical museum does. Instead, the encyclopedic museum offers a source of experience of a ‘larger’ world and its diversity, something that he feels is especially important in times of conflict. His aim for the encyclopedic museum is for a democratic approach to the ownership of objects and thus the non-secularisation of objects through focusing on their multiple accessibility. Clearly Dr Cuno feels the aim of the encycolpedic museum is to counter any ‘mono-view’ of the world. And to provide a certain freedom of encounter with objects. The question still remains as to whether this can ever be possible in a museum’s articulation and display of cultures other than its own. Museums without Walls is part of the on-going Exhibiting Research series, organised by the Courtauld’s MA Programme Curating the Art Museum in collaboration with the Research Forum. The debate explored the implications of the virtual presence of art images and collections on the future of the ‘real’ museum experience. How do museums meet the public’s need for online content? And how have digital platforms affected the role of the art curator? With Dr Sarah Hyde as chair, the speakers were from a diverse range of art-related backgrounds. As Producer of Interactive Media at Tate Online, Kirstie Beaven asserted from the start that Tate’s mission statement to increase public understanding and perception of art is key to showing art in the digital age. The focus being on participation and working closely with the curators and the gallery. Offering a curatorial perspective was Xavier Bray, Chief Curator at Dulwich Picture Gallery. Spencer Hyman, Chief Executive of Art Finder which offers an incredible (although still in its development stage) app which I now have and strongly recommend! As a former COO of last.fm, Spencer entertained us with his music/art analogies throughout. And finally, our very own Joff Whitten from Public Programmes at the Courtauld. Joff, very democratically, proffered the general consensus from the start: that digital does not and cannot replace the gallery experience. One issue that the digitalisation of the museum creates is the questioning of the role of the curator. What happens when people encounter objects in museums is very different from an encounter through a screen. But the main thing to remember is that the huge range of technologies out there are there waiting to be used as interpretative tools by museums. The debate centred on whether institutions have a responsibility to provide online content to the public. But the feeling was that this is not an option anymore and that it is essential to move out of the material world. For the museum audience being catered for today, online availability has become a requirement. From a curatorial point of view, Xavier made the point that digital is a helpful tool for sharing images and that museums have a responsibility to maintain interest in their collection, so that once a visitor’s curiosity is stimulated they have the option to go on to find out more digitally. Whether this mode of viewing encourages a person to visit an artwork in person (always the hope) or not, the focus today is on the access and providing of information via digital means. The group attempted to tackle the problematic google images and the google gallery tours in their offering of mega-pixelated images beyond the naked eye. The question is, do these tools supplant the real world or in-fact question the need even to visit museums at all? These types of tools certainly offer a new and engaging route into art but it was agreed that the pressure to provide such tools puts a strain on smaller museums, tight finances etc. It became clear that such high-tech digital involvement by museums may not be so necessary after all: the focus after all should be on the image and one’s connection with it in person as well as the social side of visiting a museum to exchange views and opinions. Thus a tension is created between the physical museum and its digital presence. But can they not unite in their offering of education and information? Isn’t it the focus of museums to give people access to their collections whether they can afford/have time to visit in person or not. So in a way they do have a responsibility to educate and therefore to have a strong digital presence that the group agreed would support the museum experience. The problem with digital images is that of the loss of scale and the repetitive reproductions that begin to wear down the pleasure of viewing the artwork. A relationship is needed with the space and surrounding works, as well as the physicality of the object. The loss of the curatorial decision process, the dialogue between objects is irreplaceable digitally and furthers the tension. It seems that the ‘utopia’ of the digital museum is to find a balance between giving the option of information and providing a personal connection for people with the exhibition overall and each individual artwork. The group agreed that the digital and physical experiences of art are equally valid but serve very different purposes. There is still a lot of restriction within digital but it can offer a lot that the physical experience cannot and having the choice is a complicated idea but is a key part of museums today. Dead Subjects Speak: Silvia Kolbowski Presents her 2010 video, A few howls again? ‘What happens when people feel incapable when reacting to a degree of power that seems impossible to contest?’ – Sylvia Kolbowski on A few howls again? Complementing the current MA on ‘Art and Psychoanalysis: Fifty Years of War in the Time of Peace, 1960-2010’, taught by Professor Mignon Nixon with Visiting Professor Juliet Mitchell (University College London Psychoanalysis Unit), Silvia Kolbowski is an artist based in New York and her stop-motion silent film A few howls again? explores issues of political resistance focusing on the German journalist and political militant, Ulrike Meinhof (1934-1976). Following the recent Gerard Richter Baader-Meinhof series as the Tate Modern, Kolbowski’s research focuses on the Red Army Faction, also known as the Baader-Meinhof group, members of which were active in West Germany in the late 1960s and 1970s. The group’s radical ideologies, which originated from the belief that a number of former Nazis continued to hold positions of power, were and are extremely controversial. The figure of Ulrike Meinhof is endlessly fascinating – a daughter of pacifist parents, she became highly respected journalist, then went underground once becoming involved with the RAF. The terrorist and extreme activities of the group led to their imprisonment and eventual deaths/suicides. 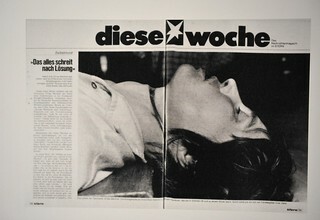 Ulrike’s body was photographed after her death in 1976; an image that both Richter and Kolbowski employ. Kolbowski calls for a move back in history to provide commentary of the present, particularly current issues surrounding what she sees as a right-wing shift in the U.S.. Baader-Meinhof is presented as a key moment of resistance in history. We are reminded of events in West and East Germany; the 1963-6 Frankfurt/Auswitz trials; the 1968 student uprisings etc. before being shown A few howls again? The film itself is short at just ten minutes, and silent throughout. 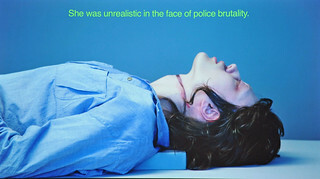 We are given a set of quotes by Ulrike, the media and other sources together with the black and white photo of her body. The body becomes coloured and slowly turns to look directly out at us. This doppelganger, this recreation of her image as a physical manifestation is not only disturbing, but highly sensitive in relation to the media-infested cult image of Ulrike herself: she speaks to us, complains that she has not been allowed to ‘rest’ even after death. We read a series of accusations that were levelled against her at the time: a militant; an unfit mother; ‘she wasn’t strong enough to bear the escalation of war.’ All the time the focus is on her mouth, her words: ‘my kind of violence made people nervous.’ This is a delicate issue, something that Kolbowski is certainly aware of in the presentation of what I would describe as a film-essay. The restless figure of Ulrike, never left alone, always mythologised, is violently shaken awake by the erratic stop-motion technique of the film. We are simultaneously shaken into consciousness through these shocking images of a ghoul-like Ulrike, into questioning current acts of political resistance and the state handling of it. Kolbowski reiterates the relevance of the RAF and Ulrike’s story to us today. Since 9/11 the symbolisation of such violence is regularly taken as a threat to the American people, hence the difficulty for Kolbowski in finding a space to exhibit her work in the U.S.. We project our own anxieties and ideas onto the image of Ulrike and, thus Kolbowski’s piece. We project our own soundtrack, our own voice onto this silent film and in doing so become acutely aware of our relation to Ulrike both as a symbol and as an individual.